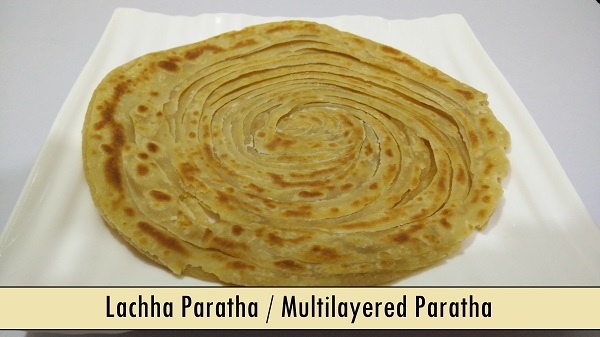 Lachha Paratha / Multilayered Paratha is one of the most popular Parathas in North India. The secret of this recipe lies in rolling Parathas in the right way. Though initially, it might seem difficult but it’s not. Learn how to make this mouth-watering multi-layered Indian Flatbread at home. Combine the Whole Wheat Flour, All Purpose Flour, Sugar, Salt, 1 & ½ tbsp. Clarified butter and mix well. Add 4 tbsp Clarified Butter and 2 tbsp All Purpose Flour in a small bowl, mix well and make a paste. After half an hour, apply some Clarified Butter in your palm and knead the dough again. Roll the dough balls and make chapatti. Apply the paste of Clarified Butter and All Purpose flour on the top surface of Chapati. Start folding and pleating from the edge, one over other as shown in the video below till you come to the end. Gently stretch the pleated dough and roll into a tight circle, secure the end by pressing gently. For more ways to create layers, watch video recipe below. Roll each spiral into a circle, lightly dust the dough to prevent sticking. Cook over a medium flame on Chapati Tawa. After a minute, flip it upside down and spread clarified butter on one side, flip again and press gently. Once you see bubbles, apply clarified butter on another side and flip again. Cook till you get light brown spots on Paratha. Lachha Paratha / Multilayered Paratha is ready to serve.